Pentecostalism is the most rapidly growing branch of Christianity since the 20th century, yet it does not lend itself well to a singular doctrine and there is, therefore, no single comprehensive account of Pentecostal theology worldwide. 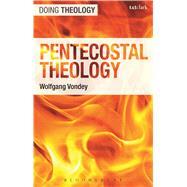 Wolfgang Vondey suggests an account of Pentecostal theology that is genuine to Pentecostals worldwide while allowing for different adaptation and explication among the various Pentecostal groups. He argues that Pentecostal theology is fundamentally concerned with the renewal of the Christian life identified by the transforming work of the Holy Spirit and directed toward the kingdom of God. Doing Theology among Pentecostals is characterized by action rather than propositional doctrinal statements. The book unfolds in four main parts illustrating the reception of life, the celebration of life, the discernment of life, and the sharing of life from Pentecostal perspectives and cast in a Pentecostal language. Twelve chapters identify the spiritual underpinnings and motivations for Pentecostal theology, formulate a Pentecostal theology of action, translate, apply, and exemplify Pentecostal practices and experiences, and integrate Pentecostal theology in the wider Christian tradition. Each chapter follows a parallel structure: (a) spiritual underpinnings and motivation for Pentecostal theology, (b) formulation of Pentecostal theology,(c) Pentecostal practices and experiences, and (d) integration in ecumenical formulations of the Christian traditions. Wolfgang Vondey is Associate Professor of Systematic Theology and Director of the Centre for Renewal Studies at Regent University, Virginia Beach, USA.